BAE Systems freely admits their newest concept tank was inspired by Batman's rugged ride as seen in Batman Begins and The Dark Knight. With Christopher Nolan directing traffic, the Batmobile became less a means of conveyance than a serious weapon in Batman's arsenal. 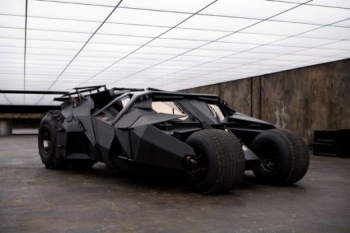 BAE Systems, a real-life defense company, has taken a page from Wayne Enterprises in the design of their newest concept tank, and has freely credited the Batmobile as the source of their inspiration. BAE Systems gave a briefing on the tanks of the future, and Stuart Nathan of The Engineer attended the talk. He overheard another journalist comment that one of the tanks presented, the Raider, looked like the current version of the Batmobile. The BAE presenter, Future Protected Vehicles project leader Hisham Awad, overheard the remark as well, and said, "Glad you said that. That's what we based it on." According to Nathan, he went on to explain, "we liked the look of that, so we designed something similar... You see, it turns like a motorbike and it has the same wheel configuration." Asked why the emulation by one of the assembled audience, Awad replied, "Well, why not? In all seriousness, we decided that we didn't have a monopoly on inspiration, and if we saw something in a film that we thought might be a good idea, why not take a look at it and see if there's something practical we can develop?" Nathan, presumably with light cycles in mind, asked Awad if he'd seen Tron: Legacy, and quotes Awad as saying, "No, haven't seen that one yet, but I want to. Have you? Anything good in it?" A side-by-side view of the Raider and the Batmobile is available here.